An Isiah Thomas personal appearance, Isiah Thomas speaking engagement, or Isiah Thomas endorsement will reflect well on your company. To hire Isiah Thomas now for any corporate appearance, fundraiser, motivational speaker event, personal appearance, autograph signing, or website endorsement please contact our celebrity agents at 1-877-6-SPORTS. We will contact Isiah Thomas or contact Isiah Thomas' agent and provide you with the booking fees and availability immediately upon your request. Direct Sportslink is the only sports speakers bureau and talent booking agency based in the United States securing only sports talent for corporations, associations, and organizations for motivational speaking engagements, personal appearances, and endorsements. We are the premier sports celebrity booking agency and a sports celebrity procurement expert. Accordingly, we will provide you with any relevant Isiah Thomas website information and booking agent details so that you can hire Isiah Thomas for your next event. 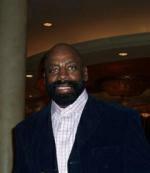 Thomas played for Indiana University and was named to the 1980 U.S. Olympic team. He left Indiana for the NBA in 1981, after a sophomore year in which he led the Hoosiers to the NCAA national title. From 1981 to 1994 Thomas had an exceptional career with the Detroit Pistons. He was a 12-time NBA All-Star, and was the Pistons' all-time leader in both points and assists. At the time of retirement, Thomas ranked fourth in NBA history in assists (9,061, 9.3 apg) and ranked ninth in NBA history in steals (1,861). Thomas was known for his dazzling dribbling ability as well as his uncanny ability to drive to basket and score on much bigger players. With fellow Detroit Bad Boys teammates, he led the Pistons to NBA titles in 1989 and 1990, and was voted NBA Finals Most Valuable Player in 1990 after averaging 27.6 points per game, 7.0 assists per game, and 5.2 rebounds per game in the series. He once scored 16 points in 93 seconds in a 1984 NBA Playoffs game against the New York Knicks. After retirement Thomas has been involved in a number of different basketball related capacities including part owner and Executive Vice President for the expansion Toronto Raptors from 1994 to 1998, owner of the Continental Basketball Association (CBA) from 1998 to 2000. From 2000 to 2003, Thomas coached the Indiana Pacers and was President and head coach of the New York Knicks from 2003-2008. 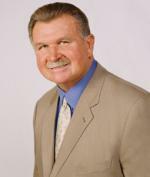 In 2009 he spent two years as the head men's basketball coach at Florida Atlantic University. In 2015 he was named President and part owner of the WNBA's New York Liberty. 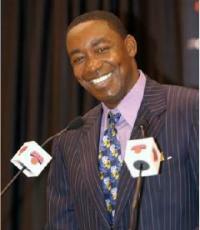 Based on your interest in Isiah Thomas as a speaker or for a personal appearance, Direct Sportslink has provided you additional links below for other sports talent with similar appearance fees, speaker topics, and categories that match Isiah Thomas.